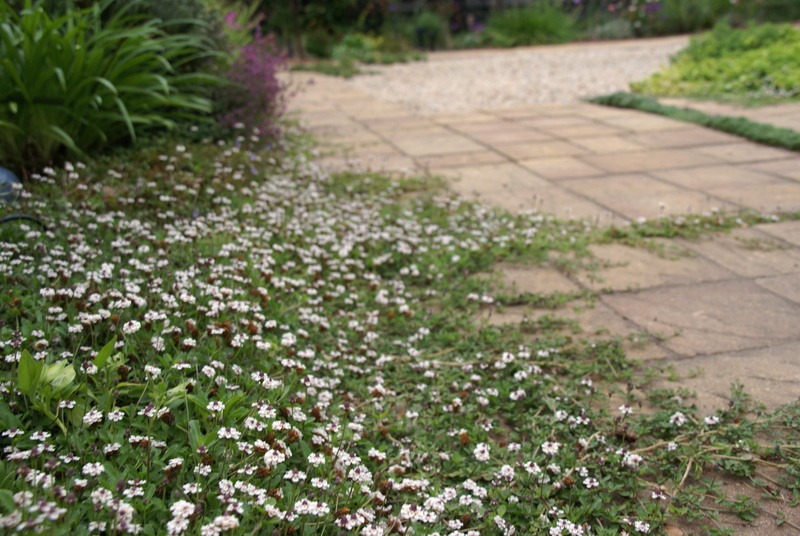 “If I re-landscape because of the drought, what happens when it starts to rain again?” This is a question I have been asked a lot lately. The re-education of the California gardener is really having an effect. 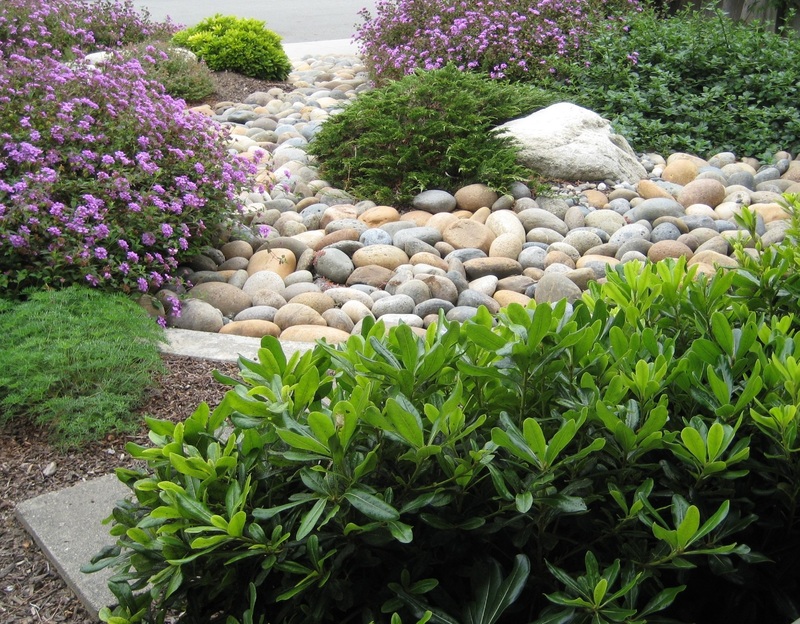 More and more clients are wanting to put in low-water landscaping, even though I’ve been designing those kinds of gardens for years…just by recommending the right plants in attractive combinations, often the client didn’t even realize it. The short answer to the question is; choose the right plants and there’s no problem. 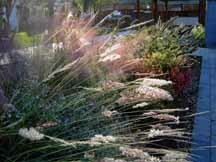 Most plants native to northern and coastal California are accustomed to winter rain. This goes for plants that are native to the other parts of the world that have their rain during the cool season too. This includes an interesting palette of plants from the cape area of South Africa, parts of Chile and Western Australia, as well as plants considered to be “Mediterranean” from which our normal climate cycle of cool=wet gets its name. More often the clients concern is the question of style. They may say “but I don’t want my yard to look like a desert”. This is not a problem either. If we define style as the specific choice and use of materials, which in the case of a garden includes the hardscape as well as the plants, then there are many options for the final result, even in a low water landscape. 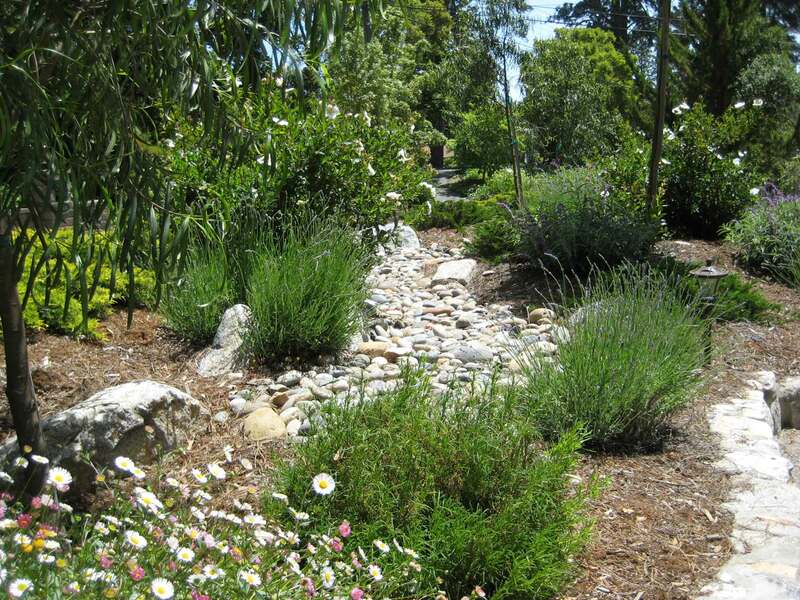 I love the challenge of updating classic garden styles for our “new normal” paradigm of responsible water use. Contemporary Craftsman – a Palo Alto residence gets an update and a stylish new path from the door to the street. 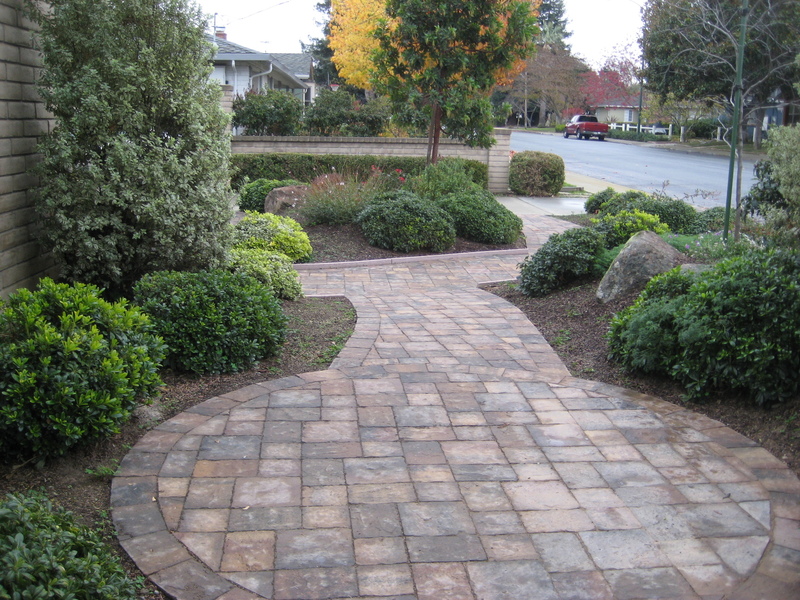 A custom concrete pathway creates a grid that shows off soft surrounding plantings in a California version of the prairie style. 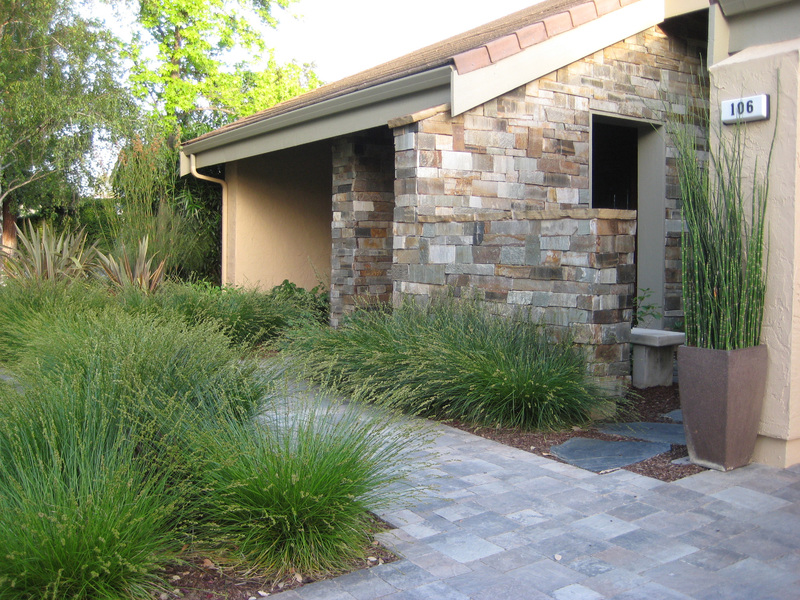 Modern Entry – Pavers were used in this front yard but in a much more contemporary way. Angles are emphasized to complement the updated stacked stone siding of the home. There is still a small lawn but the soft texture of the grass-like carex, that lines the entry path, steals the show. The homeowner periodically has them shorn down to balls to control size and add a more sculptural element. 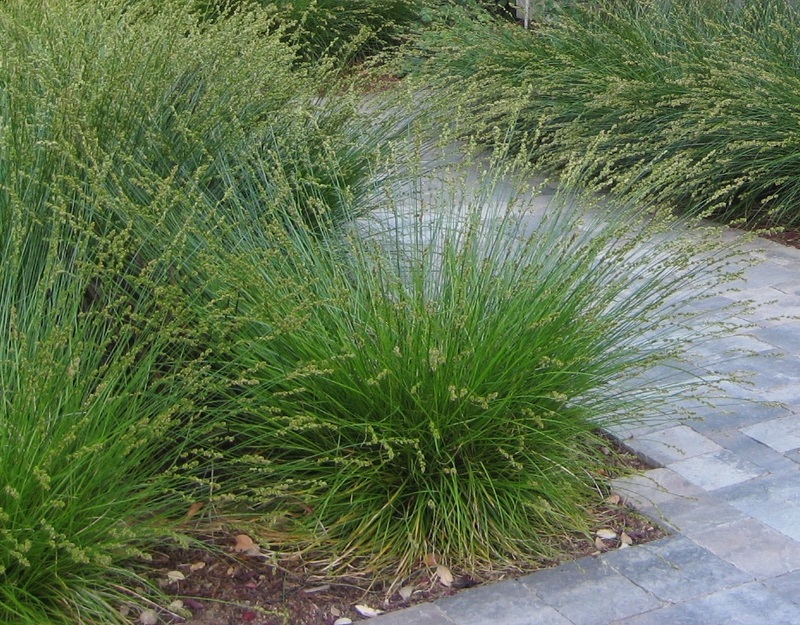 The modern looking horsetail is contained in a pot that brings an important element of structure to the entry and keeps its invasiveness under control. A new paver path of Calstone Quarry Stone leads from the new driveway to the front door. A step stone path leads to a small private patio near the entry. Design by Joy Albright-Souza, home design by CASE Remodeling, construction by Baxter Landscaping. 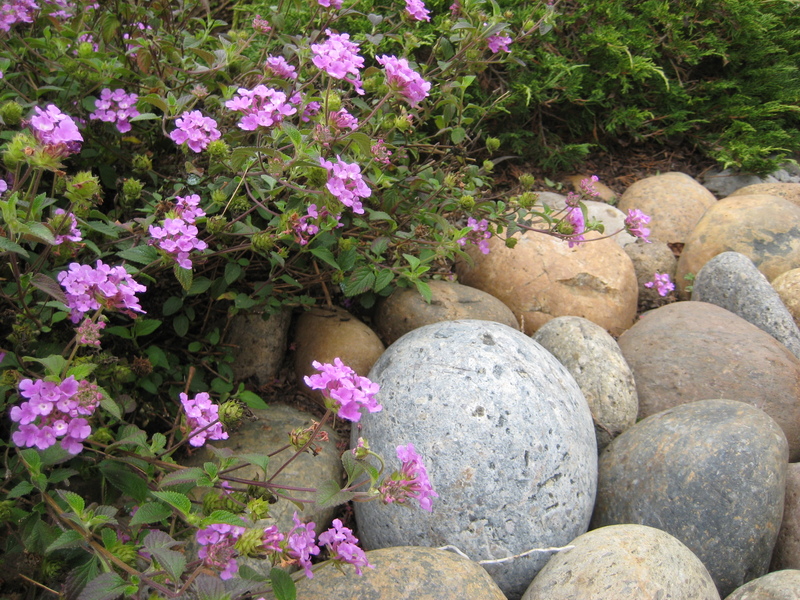 Lantana, Dwarf Pittosporum and California Ceanothus are the primary plants for this beach-side low water garden. Design by Joy Albright-Souza Installation and maintenance by Green Touch Landscapes. Rustic Romance – Cobbles are used to make a dry stream bed that meanders through the front garden of this woodland forest home. This is a landscape element that is often over-used in my opinion. But in this natural-style garden it combines with romantic low-water plantings that bring a bit of cottage style to the rustic setting. The garden was installed by the homeowner herself, using a design and planting plan that I created and the assistance of one helper. Family Friendly – This garden needed to be pet and kid friendly for a busy young family. Often homeowners want to fence every last inch, to claim maximum space for their front yard. But the clients loved the idea of the flagstone and thyme landing-area that provides additional space to disembark kids and groceries and a more roomy approach to the front gate. 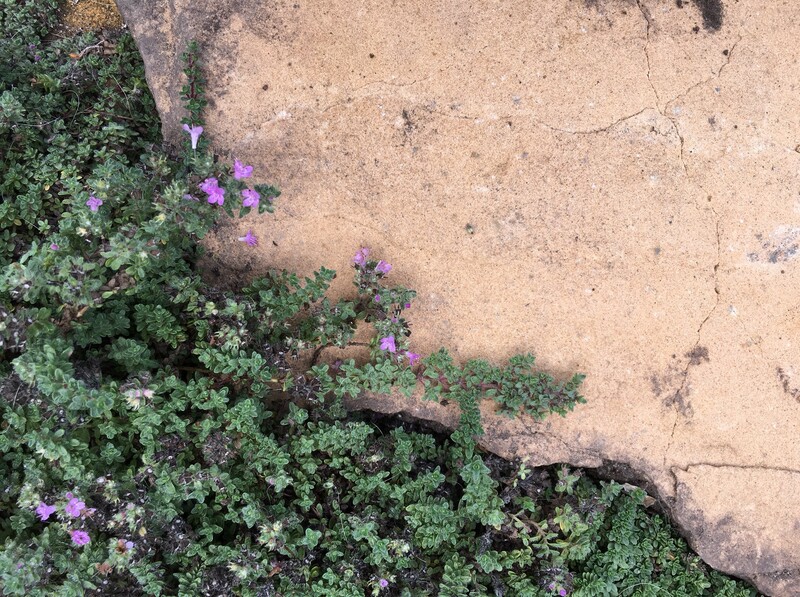 Sandstone Flagstone and low creeping thyme are a classic combination. I don’t love this for very high traffic areas but it is an attractive option for lightly used spaces. 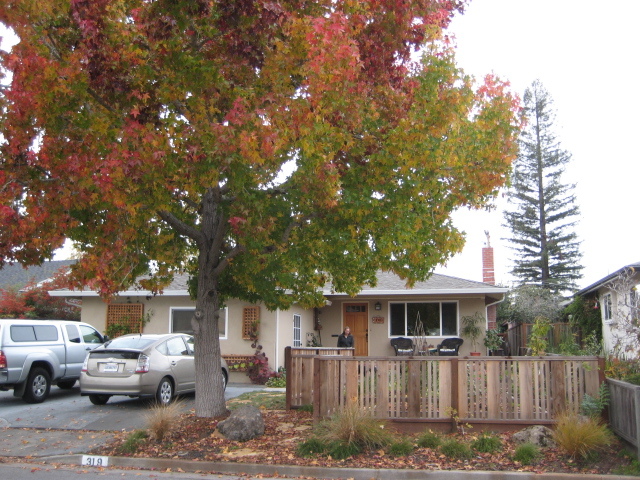 The custom fence design for this no-lawn front yard was created to leave a pleasant path around a mature tree and a landing area for unloading the car while enclosing edibles, pets and toddlers within the new garden space. – Design by Joy Albright-Souza construction by Baxter Landscaping. 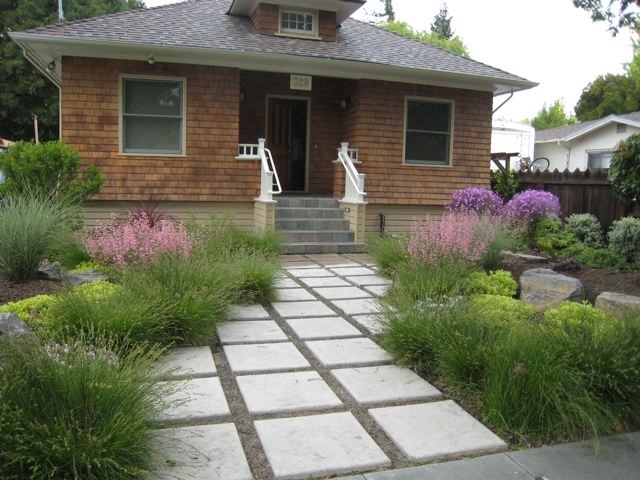 Modern Modular Permeable – Wide set paver squares and complimentary gravel create a permeable and practical pattern in this recent lawn conversion in seaside Santa Cruz. The design emphasizes a spare Asian aesthetic with colorful exclamations of succulents and other sculptural plants, for a busy young homeowner with a clear modern style and no time for gardening. 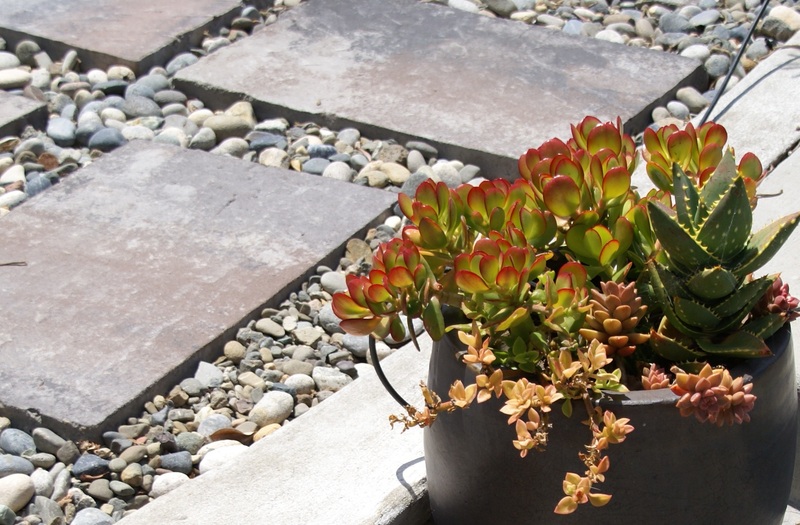 Echevarias and other succulents add a pop of color to the new permeable modern surface of this low water garden. Design by Joy Albright-Souza Install by Green Touch -Aqua Green. The pleasing combination of climate appropriate plants and practical materials is limited only by ones imagination. The key is to create the best composition for the house, the space and the lifestyle of those who will inhabit the garden. Thanks for the great examples. I’m trying to visual a lawnless front yard for my house. Thanks for the comment Dana. With the right design I bet you wouldn’t even miss having a lawn…there are so manny possibilities!